Everyone has a favorite color, and for a lot of the world that favorite color is purple. A rich, intoxicating color that comes in a variety shades and tones, purple has the intriguing distinction of being the color of royalty for many cultures, including Japan, which is home to the longest-running continuous monarchy in the history of the world. But despite its regal pedigree, for those of us who think in home decorating terms, purple usually isn't the first color that we would think to fill a room with. And perhaps that fact is exactly the reason why, when a room is filled with lavish purple shades, the results can be so breathtakingly wonderful. Here are several gorgeous purple spaces that will inspire you to give your home the royal treatment. While purple may not be the first in line to join pink as a "new neutral," certain pale shades are making a strong argument for themselves as an alternative to plain white or off-white walls. In this space, the purple complements rather than overtakes the natural shade by taking up the majority of the wall space and leaving the bare area as a feature wall. In addition to its own color contribution, the light purple shade on the walls plays the perfect host to the rooms other colorful elements including art painted right on to the wall. Color blocking is a technique that is fast becoming a favorite for designers everywhere. 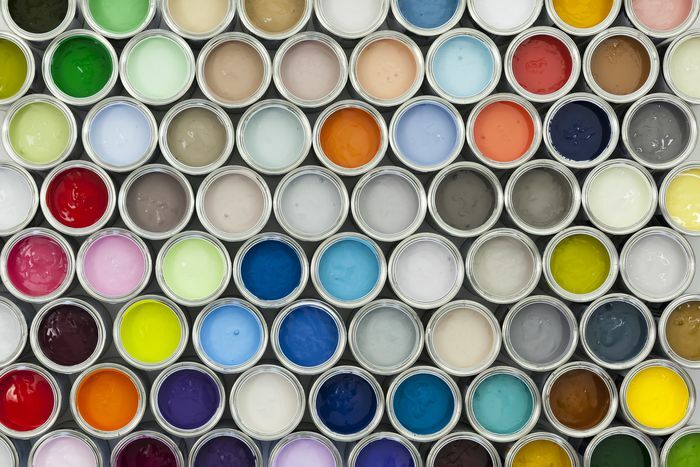 It allows you to delve deeply into a single color that either dominates the space or fills it up entirely. When looking for colors to experiment with in this way, you can't do better than purple. The variety of beautiful shades that the color offers — from light and airy to deep and moody — make it easy to create layer upon layer of color to luxuriate in. This bedroom is making excellent use of purple in all it's glory, from the ceiling all the way down to the floorboards. In between, deep dark moments in the lamps, pillows and bench cushion serve as pops of color against the lighter shade that covers the walls and bedding. The result is surreal yet serene with the promise of many magical nights of sleep. Another way to create a curated, layered look with purple but without going the full color blocked route is to find places to add moments of purple throughout the space. In this room, little pops of purple are everywhere, from the flowers to the art, but most notably in the seating. The best thing about the use of purple here is its combination with the wooly texture of the sofa. Its tactile difference from the side chair as well as the difference in the shade of purple that each employs allows them to connect through color while bringing very different looks to the room. There's plenty of options for where to start when you're planning the color story of your room. But just as in construction the best way to build a color story is often from the ground up. When your floor is set to be the center of attention a bold color like purple is the perfect choice for bringing eyes down to ground level. Just like with walls, color on the floor acts a stage on which all other colors in the room get to play. Purple offers some great advantages in this area because its a color that plays so well with others. Here, warm wood tones along with black, blue and yellow all fit together on a purple field. In this dining room, the purple banquette seating is a gorgeous addition to the neutral space. Fitting in perfectly with the light gray of the wall and the light blue of the kitchen island, the purple seating gives a warm pop that wakes up the space, filling it with personality and style. 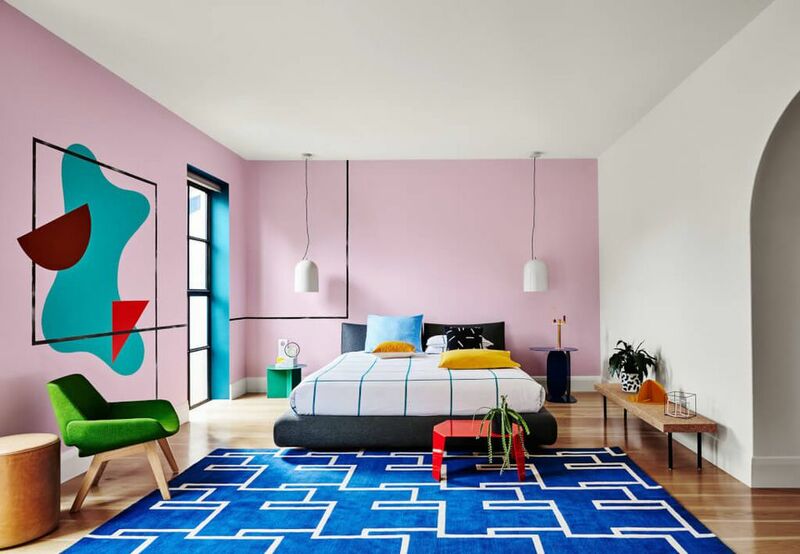 Color is coming to the walls of bedrooms everywhere, and as we're learning that black and other dark bedroom walls make a dazzling statement, more colors are lining up to join in on the fun. Bright shades of purple like the one seen in this space are a perfect choice for bedrooms because they are colorful and energetic yet warm. The combination makes for a cozy space with a wall color that will make you smile every time you wake up. Purple doesn't just work well with other colors when they're combined in a room, it blends beautifully with a number of other shades in the paint can as well. This picture-perfect vignette comes to us courtesy of a deep an introspective wall color brought about by the mixture of purple and dark brown. While at first glance the wall may seem to be simple brown, complementing the wood tones in the space, it doesn't take long to notice that there's something extra in the color of the walls. While subtle, the purple in the color gives it a little extra depth and life which adds to the drama of the space. If you've got some furniture pieces that are in need of an update, reupholstering is great, but why not throw in a new color for some added fun? This classic chesterfield piece takes on a whole new life when reimagined in a cool new shade. The stairs are a woefully underutilized design opportunity in many homes. And that's just too bad because look how much fun you can have when you make them a part of the decor. This home is making great use of every inch that its stairway has to offer. The lively purple tone on the walls reminds us how great a tone purple is to hang a gallery wall against while also complementing the red and blue of the colorful rug. Best of all is the purple runner that trails down the stairs giving us that top-to-bottom look that purple does so well. Wallpaper is a beautiful way to get color into any space and purple is no exception. In this color blocked living room, the oversized floral wallpaper is the central element that ties the room together. With purple paint on the ceiling and hints of the color on the floor rug, the look is complete.